For general questions, email info@bikewalkkc.org. Office Hours: 8:30 a.m. to 4:30 p.m., Monday-Friday. B-cycle (Bike Share) Customer Service: 816-945-9545 or bcycle@bikewalkkc.org. contact 816-205-7056 x2 or communications@bikewalkkc.org. 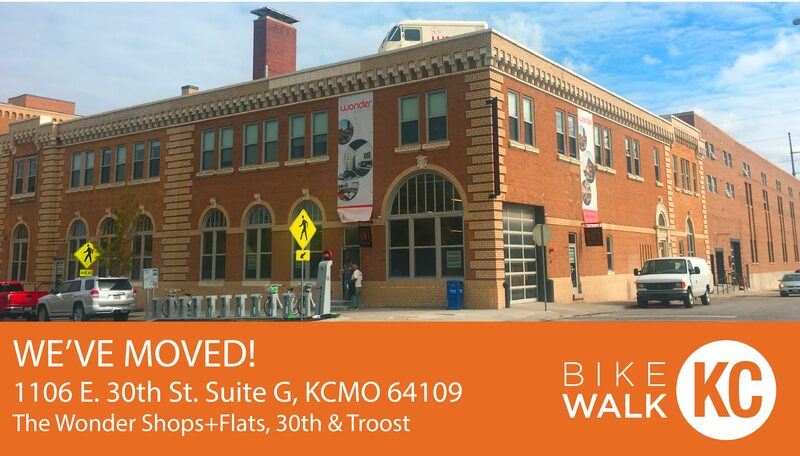 Our new office is on the first floor of the Wonder Shops+Flats building at 30th and Troost in Midtown KC. We are between Downtown and the Country Club Plaza. The RideKC Troost MAX and #25 buses stop one block south. A KC BCycle bike share station is coming in October 2018. Car parking is available streetside.